Two Future Visions. The first is on the Household of Tomorrow. The second considers the security issues of a vertical city. What would the Singapore of tomorrow be like for an HDB household, if the recommendations by the Committee on the Future Economy (CFE) bear fruit? Insight takes a leap forward to 2030. Looking out of the window of his 15-storey HDB flat, businessman and father-of-two Alex Chin marvels at the scene before him. Thirteen years ago, when he was 20, this flat located at Tengah, a former military training area in Singapore's west and ringed by a 100m-wide, 5km-long forest corridor, did not exist. But if it did, he would have been looking out over a typical multistorey HDB carpark, full of a mix of sedans, SUVs, motorbikes, vans and pick-up trucks. Gantry bars would be rising and falling as the electronic parking system deducted payment from in-vehicle units. Elderly residents would be making their way painstakingly across the road to get to the coffee shop for a bite. Children would be getting off the bus from school. Foreign workers might be yelling as they gesticulated to a rubbish truck backing up to a communal rubbish chute. Now, there are far fewer parking spaces available, with land being set aside for other uses. In fact, the town centre at Tengah - Singapore's 24th HDB town - is entirely car-free, with an underground network of roads serving public buses and other vehicles. Besides, technology has made cars with drivers redundant. Self-driving vehicles have proliferated in the form of taxi services and commercial vehicles transporting goods and freight to logistics centres from Changi East and the Tuas mega port - to which Singapore has been moving its port activities from Tanjong Pagar and Pasir Panjang. There are also far fewer foreign workers collecting rubbish, thanks to an underground pneumatic waste collection system that collects all the rubbish that residents throw down the chutes and transports it by underground pipes to a centralised bin. The trash is later transported to incineration plants. As he looks onto Tengah Reservoir in the distance, Alex sees a large, dark patch on the still waters. These solar photovoltaic systems, placed on floating platforms, are now a feature in every reservoir islandwide, providing clean energy to power Singapore's electric grid. Hunger pangs remind Alex that it is time for dinner. He orders nasi briyani and rojak, which will be delivered to his block by drones. He goes to the bedroom and urges his seven-year-old daughter to finish her online maths assignment from school. Shortly later, his wife Priyanka returns to their flat. The 32-year-old data analyst has just commuted back via high-speed rail after a work trip to Kuala Lumpur. They chat over dinner about what to do when they next have time off. She suggests Orchard Road, because while they can buy anything online from anywhere, there's that old-school buzz of seeing physical merchandise and being part of a happy crowd doing the perennial Singapore pastime of shopping. The popular shopping belt has undergone a major revamp - a section has been entirely pedestrianised, there is a plethora of boutique shops selling local wares and there is a theme park that attracts tourists and shoppers alike. Like Orchard Road, much else in Singapore has changed over the span of 13 years. The Jurong Lake District has morphed into Singapore's second central business district, a transformation sparked by the 350km high-speed rail line linking Jurong East to Kuala Lumpur. Pavements in the area are wide, and friendly to both pedestrians and cyclists. A bicycle-sharing system makes it easy for tourists to explore the area, while electric feeder buses ply the estate. Unforeseen new technologies and companies have also emerged to disrupt industries and lifestyles, just how Uber and Airbnb did in the previous decade. For Alex, 2017 was a milestone year as that was when a high-powered committee released a report that helped change the course of his career. Back then, he was 20, had done his national service, and was taking the tried and true route that had the approval of his parents - studying accountancy. But then the Committee on the Future Economy report came out and his plan that would have seen him in a safe white-collar job seemed ill-equipped for a challenging future. He realised that if he could combine the IT skills he had picked up out of interest with his awareness of robotics and his practical skills with numbers, he could start his own business based on his interests. He withdrew from his accounting programme and switched to reading biomedical engineering. The Government was making it much easier to start a business by easing regulations to make it easier for start-ups to get funding from venture capital firms and providing more support for enterprises venturing overseas. Society was also changing - risk-taking was encouraged and no longer so scary. The education system was also shifting tack, helping children to find their own path among all the opportunities now laid out. The priority was shifting from academic excellence to picking up practical and soft skills, as well as taking on board the need for lifelong learning. True, his parents were stuck in the old ways of thinking, being fixated on academic grades and opting for safe career choices like accounting and finance. But look at his father - this safe way was no longer so safe. He had been made redundant twice from his job as a bank manager, but was looking at getting new skills to remain employable. Anyway, at that age of 20, Alex had read the signs. Entrepreneurship was the way to go. If he could think of a product, develop it, make use of the grants available, the shared knowledge from peers and the hook-ups from government agencies, he could develop a home-grown business. More than that, he could grow it beyond Singapore. The CFE report had signalled to him that the world was his oyster - make that, rice bowl. So five years on found him having founded a company to manufacture components for robotic surgery systems. His then-fledgling business received a boost in 2023, when it was awarded a contract to supply Singapore's Health Ministry with mechanical parts for robot-assisted surgery. That helped him develop a track record and paved the way for him to expand into Cambodia, Indonesia, Malaysia and Laos - members of the Asean Economic Community and the Free Trade Area of the Asia-Pacific. He also received customised support and funding from IE Singapore to expand his business, which is headquartered in the Jurong Innovation District. The 600ha industrial park houses learning, research, innovation and production activities. Entrepreneurs like Alex who have ventured into Singapore's regional hinterland have been critical to maintaining the country's growth. Through a combination of remaining open to trade and investment, nurturing growth industries and equipping its workforce with deep skills, Singapore has managed to maintain growth of around 2 to 3 per cent each year, while its population increased to 6.9 million. It has remained open to foreign talent, even as it raised the criteria for employment pass applications. Manufacturing still accounts for close to 20 per cent of GDP. These results have defied the expectations of observers who panned the CFE report for being too general, uninspiring and a rehash of old strategies when it was released 13 years ago. Some attribute the good results to the Government and Singaporeans taking heed of the recommendations laid out, from focusing on skills above grades to remaining open to trade. Another factor behind growth is the emergence of the digital economy, with more Singaporeans opting for careers in the data and cybersecurity industries. When she isn't commuting to KL for work, Priyanka is based in Punggol, which has become a cluster for businesses in the digital, infocomm technology and cybersecurity fields. The 32-year-old too, had taken the cue from the CFE report about how the digital economy was set to flourish. She thus opted to read data science in polytechnic and at university. Alex wonders if their four-year-old son Elon will eventually work in the digital sector. That could happen, he thinks, if his son is posted to a vocation where he gets to learn cybersecurity skills during national service. The number of career cybersecurity specialists has gone up, after the Ministry of Defence created new technology vocations within the Singapore Armed Forces to equip national servicemen with cyber warfare skills. Alex pictures his son sitting in front of a computer terminal, learning how to write programs to counter malicious computer software - that would be a far cry from his own national service when he was a tank driver, he thinks. The structural shifts in the economy have forced many to skill up or be left behind. Priyanka's father, Mr Arjun Chikkarangappa, 59, had driven a prime mover transporting cargo around Tanjong Pagar Terminal for more than 20 years. But when operations at Tanjong Pagar moved to the Tuas mega port in Tuas South, he found that automated guided vehicles had made his old job redundant. The new Tuas mega-terminal - meant to be a showcase of new technologies that would boost productivity and reduce the reliance on manpower - was outfitted with automated yard cranes and self-driving vehicles that transported cargo. Reluctant to give up working in the only industry he has known, Mr Chikkarangappa went for training to learn how to do basic programming for the automated vehicles. An Industry Transformation Map for sea transport, coordinated by the Maritime and Port Authority of Singapore, had highlighted the importance of helping older port workers reskill. For Alex, constantly learning new skills and keeping abreast of new technologies has become essential. As he whips out his hipster-retro iPhone 10 to book a self-driving Uber to the new Terminal 5 at Changi Airport for a work trip, he thinks about how the increased government support has made it much easier for businessmen like him to venture abroad. The country has also evolved from just being a key site for companies' regional and corporate headquarters to a "runway economy" where new ideas can develop, and eventually take off. As his plane leaves Singapore's third airport runway, he realises people like him have indeed become pioneers for the next generation - just as the CFE report urged. A passenger drone (unmanned aerial vehicle, or UAV) —EHang 184 — was unveiled last month at the World Government Summit held in Dubai, where the Road and Transportation Agency of the United Arab Emirates then announced plans to commence regular flights (flying taxis) by July this year. In Singapore, researchers at the Nanyang Technological University are designing an air traffic management system for drones. In London, the new mixed-use Canaletto tower was designed to create vertical communities. Such developments not only underscore the practical utility of new technologies and architectural ideas, but also, and more profoundly, how growing urbanisation and the advent of smart cities herald the increasing territorialisation of the vertical space. The foreseeable mixed use of the vertical space in cities — vertical urbanism —will have strategic implications on homeland security. To sustain long-term economic vibrancy and livability, cities and city-states are grappling with the complex challenges of accommodating increasing population density and economic activities amid land constraints. With innovation and the use of disruptive technologies, the optimisation of the urban space could expand radically beyond existing concepts of land use zoning, and high-rise residential and commercial buildings to include the mixed use of the vertical space. Socio-economic activities and infrastructure could develop in novel ways in the vertical space as the ground would be less horizontal. 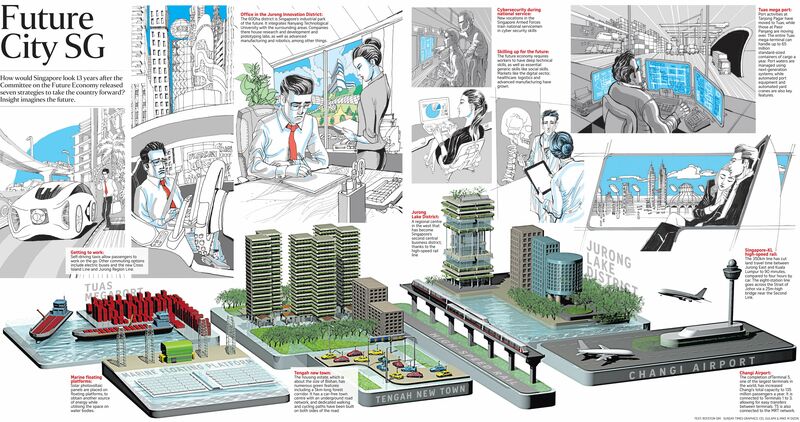 Futurists have envisioned the proliferation of vertical communities in cities as more, taller and smarter buildings sprout in each precinct, with amenities such as parks and schools at the upper levels. High-rise farms could feed the growing population of land-scarce cities while minimising the risks of droughts and diseases. Integrated road-rail viaducts, such as the Tuas West Extension in Singapore, could enhance transport connectivity while reducing road congestions. As the technology and regulations on the use of drones improve, the lower airspace could function as streets in the sky for certain public and commercial activities. Indeed, the scale of vertical urbanism could potentially broaden as communities, corporations and governments discover novel applications from high-rise, high-density infrastructures and drone technology. Besides safety and privacy concerns, vertical urbanism could have deep policy implications, as it entails the vertical expansion of public space and therefore introduces strategic considerations for governance, including homeland security. These considerations could include delineation between privately-owned and navigable lower airspace; circumstances where the aerial vantage point of drone traffic or high-rise activities could encroach into private space; enforcement of drone traffic; and monitoring of vertical space for law enforcement and security. Vertical urbanism could expand the operating terrain and scope in the policing of public space, and create new points and lines of vulnerabilities that could complicate policing and emergency response efforts. The vertical space, in addition to the streets, could present additional vectors for evolving crime and security threats. For example, the proliferation of drones in increasingly high-rise cities could inspire new criminal tactics of home invasion that evade the surveillance of street-level police CCTVs. A terrorist drone attack on a high-rise communal space could generate an alarming spectacle and panic comparable to an attack on the ground. Cyber threats arising from the use of drones for “rooftop packet sniffing” could become more substantial as more essential services in buildings, including homes and businesses, are connected to the smart infrastructure. The security agencies’ resources would be stretched and their current operational tactics and procedures would be challenged. There would be implications on surveillance, and performance in terms of police presence and incident response. Securing the vertical space of cities of tomorrow would fundamentally entail more than traditional strategies for vertical patrols and neighbourhood watch. Strategies for intelligence, operational capabilities and community vigilance would need to adapt to meet the challenges. Intelligence-led policing would require a three-dimensional appreciation of the operating terrain, as crime hotspots, persons of interest and anomalous activities, including hostile drones, might not be horizontally limited to the streets. This approach could also help ascertain whether any vertical space is optically or/and physically inaccessible to security forces, thus creating a vacuum in security. Operational capabilities need to adapt by tailoring tactics, procedures and training to suit the vertical terrain, including in the interception of hostile drones. Leveraging new technologies — police drones, high-rise CCTVs, Internet of Things (IoT) sensors in buildings et al — could enable better mobility and reach in order to surveil and respond to incidents at vertical locations; as stated in a paper on “SMART policing for smart cities” commissioned by the Indian Police Foundation, community vigilance would be crucial in supporting security agencies to monitor and deter threats in the vertical space, but this requires the elements of the security awareness and sense of guardianship in the community. These elements could be fostered through regular social interactions, as indicated in a paper on “Planning for Vertical Community Safety” by the Australian Criminology Research Advisory Council. However, challenges abound as factors such as the physical features of high-rise buildings and socio-cultural differences arising from migration from within and outside the country could potentially hamper social interactions. Given the need to develop effective vertical policing strategies, security agencies would have to participate in the planning and development of vertical space in cities. This should begin with close coordination with the public, private and community stakeholders from the outset. Muhammad Faizal Abdul Rahman is a Research Fellow with the Homeland Defence Programme at the Centre of Excellence for National Security (CENS), a unit of the S. Rajaratnam School of International Studies (RSIS), Nanyang Technological University, Singapore. This piece first appeared in RSIS Commentary.